The herb garden is breathing in deep and begins to breach. There are pockets of white among all the greens. Sweet cicely in full flush has delicate milk-white flowers and vibrant emerald leaves. This herb is sweet by name and by nature, which is why it works beautifully with fresh, sour gooseberries. I like to eat my oysters with something that brings acidity. The gooseberry and sweet-cicely thing does just that, without having to work too hard. It’s pretty amazing. Slice the gooseberries into roughly 5mm (1⁄4in) rounds and place them in a bowl. Add the cider vinegar, sugar, and halfthe sweet cicely leaves, then season with salt and pepper. Allow the gooseberries to sit in the vinegar mixture while you shuck the oysters. of the shell at the pointed back end, where the hinge is located. Once you have the tip of the knife in, you can lever the shell open a little. Slip the knife along the underside of the top half of the shell, which will sever the oyster’s adductor muscle, allowing the shell to open fully. Carefully slide the knife blade underneath the oyster to release it completely. Try to save any liquor in the shell. To serve, place the oysters in their half shells on a suitable serving plate or board. 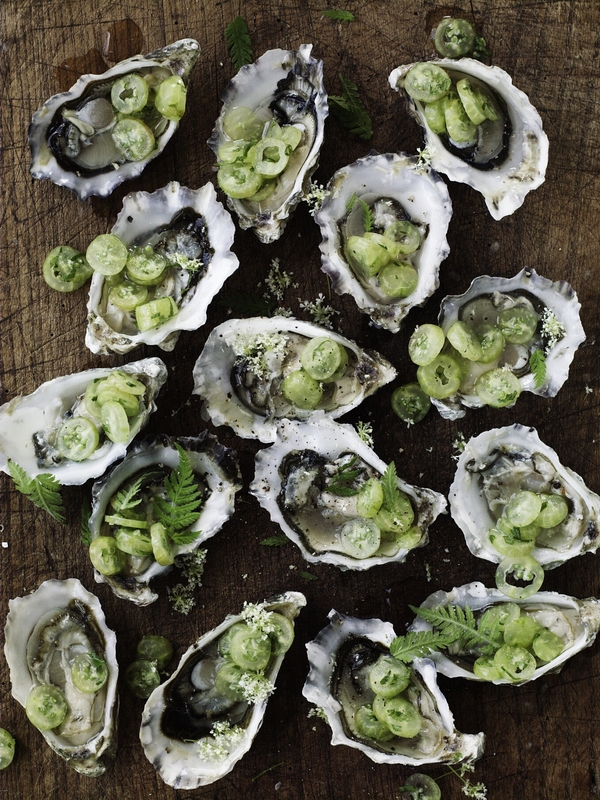 Spoon a little gooseberry mixture onto each oyster, tear over the remaining sweet cicely leaves and serve with a scattering of cicely flowers if you have them.